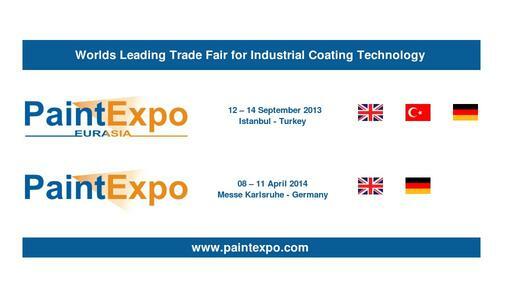 With over 25 percent more exhibitors and visitors, the 4th PaintExpo registered record growth. The 410 exhibitors from 24 countries experienced an excellent atmosphere thanks not only to the quantity but also the quality of the inquiries and concrete projects the 8,028 visitors brought with them when they came to the international trade fair for industrial coating technology in Karlsruhe (Germany) from 17th till 20th April 2012. The visitors themselves were delighted with the numerous comprehensive and representative products on show. “You can tell that the PaintExpo was taken even more seriously by the industry this year and that it has become even more professional. Only trade visitors searching for solutions to their problems come to the fair. The fair has also become more international. Around one third of the enquiries and projects we received during the four days of the fair came from foreign visitors”, reported Petra Schotte-Pirker, Head of Marketing at WIWA Spritztechnik Wilhelm Wagner GmbH & Co. KG. 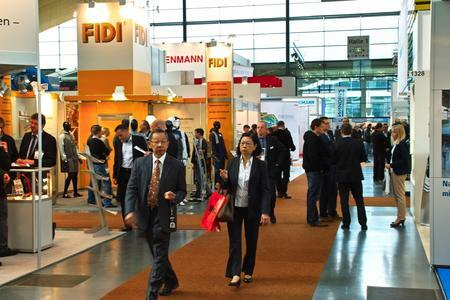 Nearly all of the 410 exhibitors - 25.4 percent more than in 2010 - were pleased with their trade fair attendance. Participating companies came from 24 countries and the proportion of foreign exhibitors was 26.3 percent – that’s about 6 percent higher than in 2010. 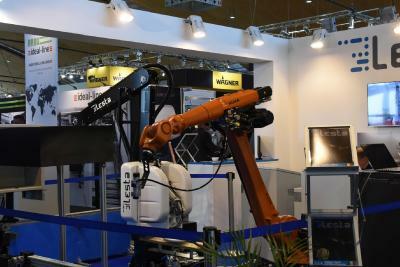 The companies presented their products and solutions for wet painting, powder coating and coil coating on a net surface area of 10,406 square meters – a plus of 28.8 percent. 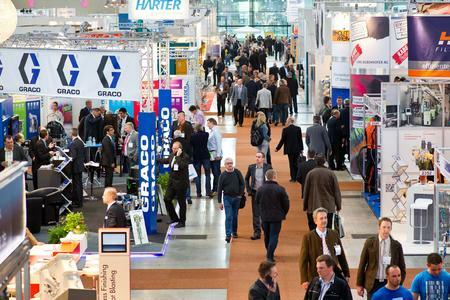 The number of visitors to the international leading trade fair for industrial coating technology also rose by an impressive 25.5 percent to 8,028. 21.2 percent of trade visitors came to Karlsruhe from foreign countries. In total, 63 countries from all continents were represented. It wasn’t just the quantity and internationality but also the quality of the visitors coming to the event organized by FairFair GmbH that was positive. As a result of their excellent technical and decision-making skills, exhibitors stated that discussions with visitors were about very specific topics. “We attended the PaintExpo for the first time this year and trade fair has been a real bonus for our company. In contrast with other trade fairs, this one is focused on industrial coating technology, enabling us to make lots of interesting new contacts with important companies and arrange concrete dates for further talks”, enthused Claudia Vignati, Management Assistant of CHEMTEC Srl, an Italian manufacturer of pretreatment systems. Rüdiger Strunz, Manager Sales and Marketing at CWS Powder Coatings GmbH, was also very pleased with the way the trade fair went: “For us, the PaintExpo has become the major international trade fair. All of our foreign subsidiaries are represented here and we’ve had many qualified inquiries also from Eastern Europe, the Benelux countries and Asia. We’ll definitely be attending the PaintExpo again in 2014”. Karin Schumann, Marketing at ITW Industrial Finishing Oberflächentechnik GmbH is also convinced that they’ll be back in two years’ time. “It exceeded our expectations. We had a lot of international visitors to our booth from the automotive, metal processing and plastics coating industries. We’ve also made many new important contacts. Our management also came to the trade fair and decided that it is a must to be represented here”. Martin Heinrich was equally surprised by the number of visitors. “It’s the first time we’ve exhibited here and the response has been overwhelming – we hadn’t reckoned with so much interest. Many visitors had already heard about nano ceramics and talked to us about very specific projects. We’ll definitely be back in two years time”, reported the CEO of D O K Chemie GmbH. “The trade fair was excellent for us. We were able to meet up with many of our South American customers and make new contacts, hold talks with partner companies and inform ourselves about the latest technologies and trends. We also found out that PaintExpo Eurasia is taking place in Istanbul next year and we’ll be attending that, too”, Pablo Meeuwes, Commercial Manager of Göttert SA in Argentina, summed up his trade fair experience. The aim to get to know first tier suppliers was the reason why the Australian paint manufacturer Coating & Industrial Technologies Pty Ltd attended the PaintExpo and that was more than fulfilled. “We’ve been able to establish excellent contacts not only with visitors from the automotive industry but also with manufacturers of glasses, furniture and many other fields where plastics are coated. Visitors came, of course, from German-speaking countries but also from Italy, the USA, Japan, Korea, France, Holland, Belgium and Eastern Europe. We felt very much at home at the trade fair, which was also thanks to the super organization”, said CEO Joachim Riederich (Jogi). 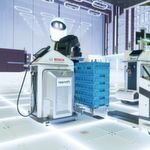 For users around the world, the PaintExpo is also the first choice when it comes to solutions for wet painting, powder coating and coil coating. 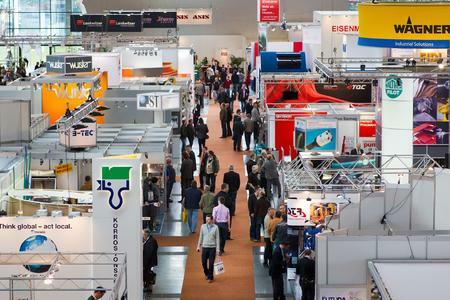 This is partly due to the high concentration of industrial coating technology companies participating and also due to the world’s most comprehensive and representative range of products on show, from pre-treating through paints, systems engineering and application technology right up to final inspection and packaging. Please send us a copy of or link to all publications featuring content from this press release. Thank you. “This was our first time at the PaintExpo and, on the whole, we’re pleased with the way things went. The organization was very good and we were able to establish a number of high quality contacts with companies from Eastern Europe. Unfortunately we didn’t have as many visitors to our booth from Western Europe as we’d hoped. But we’ll definitely be attending the PaintExpo again in two years’ time. “Every visitor who came to the PaintExpo knew about UV and no one asked what’s your product. You really only meet people who are in the know, also, visitors bring concrete projects with them. That’s why it’s the only trade fair IST Metz attends in the field of three-dimensional coating.